There we have our favorite TV personality iCarly. And now iCarly will help you turn on the light. This light switch cover has a picture on it of iCarly and who does not want her in the room. Installing this switchplate is pretty easy it just has two screws and you don’t even have to know anything about electricity. 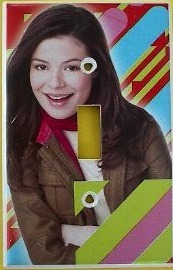 Get iCarly in your room with this iCarly Light Switchplate.